[NY Daily News] — Hasidic patrols in Williamsburg rule the streets like real cops – driving unmarked cars, flashing emergency lights and snatching people they think are criminals, say residents and police. Members of the private security patrols cruise the Brooklyn neighborhood listening to police scanners. They don’t carry guns and have no arrest power. Some in the neighborhood – a mix of blacks, whites, Latinos, Hasidim and hipsters – say they help keep crime down. Others contend the patrols unfairly target people of color. “We are trying to keep the neighborhood safe,” said Hershy Deutsch, 23, founder of the Kings County Safety Patrol. 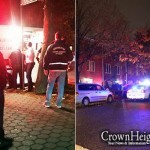 Williamsburg’s most well-known Jewish patrol is the Shomrim – named after the Hebrew word for guard. There are similar groups in Crown Heights and Borough Park, Brooklyn. The Shomrim patrol wouldn’t talk about the lights, but the NYPD suggested the patrol was running afoul of the law. “The placards are not official, and red rotating lights are restricted to authorized police and fire vehicles and ambulances,” said Paul Browne, the NYPD’s top spokesman. Jewish residents said they’re surrounded by crime-filled public housing projects and need more eyes on the streets. Last week, police said Dwight Chaparro, 29, whacked Rabbi Mordechai Stern, 57, over the head with a wooden shelf. Chaparro’s mom said her son was covered with “black-and-blue” marks because Shomrim members beat him up. He was charged with felony assault, menacing and criminal possession of aweapon. John Figueroa, 14, said a Jewish patrol member accused him of stealing a Hasidic kid’s bike and then cracked him in the nose with a walkie-talkie. Records show Yakov Horowitz, 32, was charged with assault after the May 18, 2009, attack on Wythe Ave. “They thought we stole it. I was like, ‘Y’all not taking this bike,’” Figueroa said. The Williamsburg Shomrim didn’t return calls about Horowitz. To fish with the Daily News! NYC liberals living in haughty-totty enclaves don’t know what life is like for people living in the neighbourhoods where Shomrim patrol (until of course they are themselves attacked chas v’sholom and then they very quickly change their tune). I betcha that the upright non-Jewish residents of these areas are also mighty grateful for Shomrim, because they know that it provides them relief from criminal activity too. Why is it always the crooks and their mothers who complain about the community patrols?! Let the journalists continue with their sensationalist journalism and we’ll continue taking care of ourselves the way we want. It’s not a hit job in the slightest. Both sides viewpoints are given – as much as they were willing to cooperate. Why put the CH Shomrim scooters pic? That’s not fair to them and nothing to do with the article. Every citizen has the right to protect himself. Every family has the right to protect themselves. Every community has the right to protect themselves. this is a hit job dude. obviously, but not the right to beat someone down just because they are a goy. thats what they do in williamsburg ive worked there for more than a decade and i see how they operate. we always trying to be politically correct and find favor in the eyes of our neighbors. What will they say. Shomrim must not forget who they represent and who is their real protector and lehavdil who is the enemy. Only those who fought nazis know the truth. Go take a walk down Lee avenue late at night, get a wooden plank strike you from behind, then talk.